Rich and flavourful Payasam/ kheer prepared with carrots and almonds. Kheer can be prepared within 30 minutes. Pressure cooker makes it super fast and tasty. Carrot badam Kheer can be prepared for any Indian festival, special occasion, party etc. As a kid, I was a picky eater when it came to vegetables. Don’t know why, but I always hated carrots and beetroots. Having a big sweet tooth, I accept these vegetables if it in dessert form. Amma frequently prepares sweets like beetroot halwa, carrot halwa and carrot Payasam. Whenever I see beetroot and carrot in fridge, I always have this urge to prepare sweets. Now a days I have cut down the frequency but today being the first day of the tamil month Aadi (Aadi Friday in some places), thought of making this healthy and special payasam for the auspicious day. Saffron not only compliments to the taste but also gives lovely color to the payasam. If you are looking for a party winning dessert, this is perfect. Condensed milk, whole fat milk and evaporated milk makes carrot vadam Kheer delicious and creamy. Pressure cooker makes it so easy. 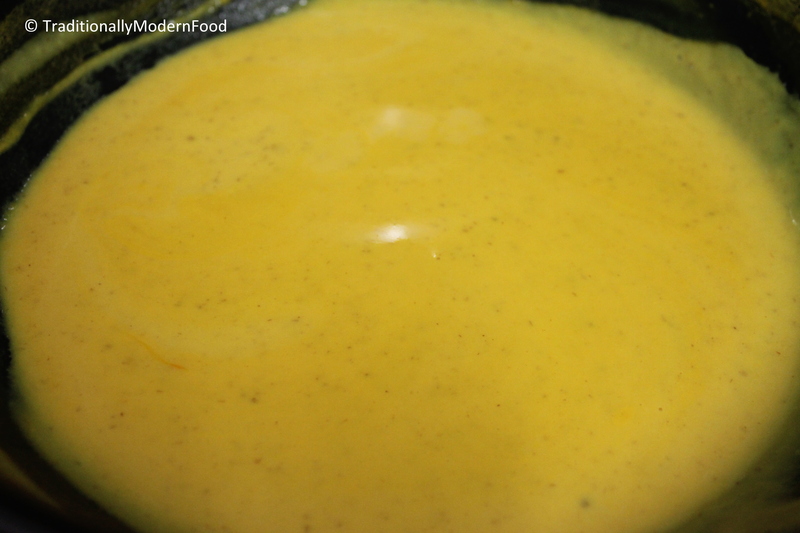 Within 30 minutes the tasty payasam can be prepared. 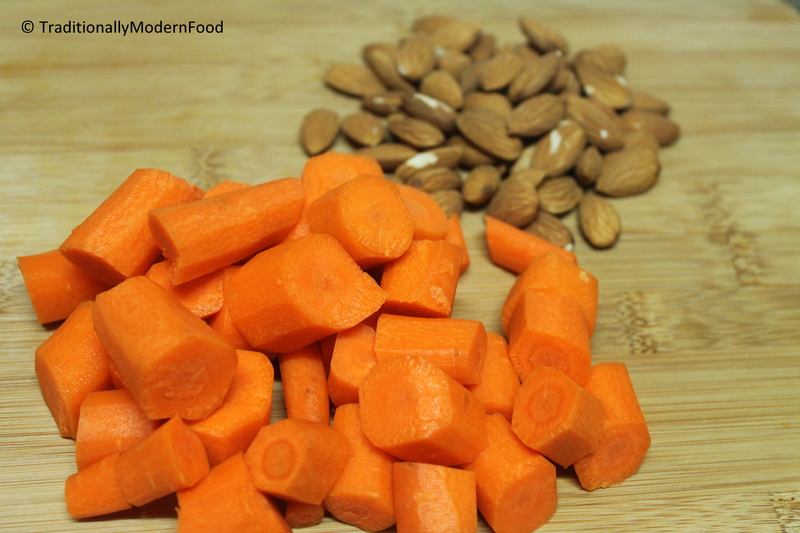 Cooker held for easy cooking of Carrots and almonds cooked in milk. Love the flavour that cardamom adds to a dessert! Wow! I had heard a out carrot payasam but not tried so far.. Surely try this easy recipe 🙂 Thanks a lot! Wow! I had heard about carrot payasam but not tried so far.. Surely will try this easy recipe 🙂 Thanks a lot! 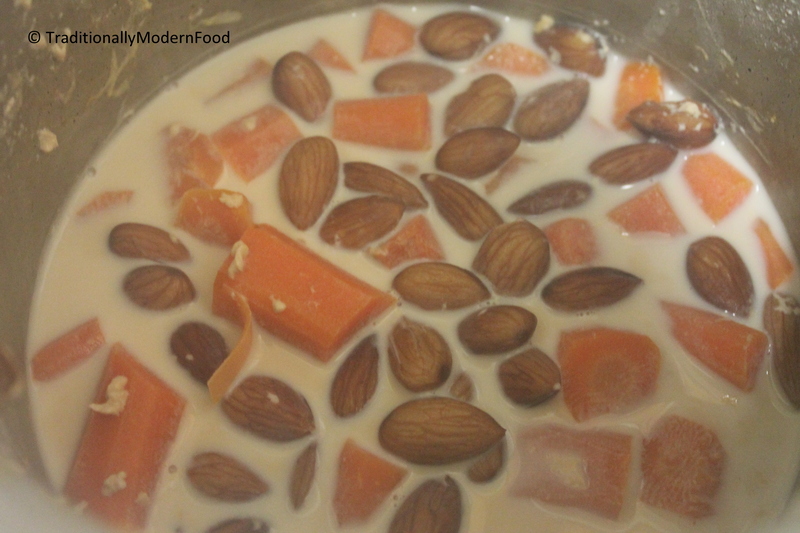 Wow I love carrot payasam and this one with almond looks fab….wil give a try and let you know. ..thanx for this wonderful recipe…..
OMG the flavor combinations in this are to die for. I love saffron and cardamom. Almonds, milk and sugar??? YUM! This is interesting and what’s better is that it’s not a scary color after it’s made. Sometimes colors make it really hard for me to eat something – especially if I’ve not tried it before. Love the flavors in this soup – carrots, almonds, condensed milk AND saffron. Yum! Love the colour vidya! !and the saffron threads too!!Delicious!! Delicious carrot payasam I haven’t tried yet. But sure going to try next time. This looks quite tasty. I like the cardamom and coconut milk. This sounds really wonderful. A great summertime dessert.